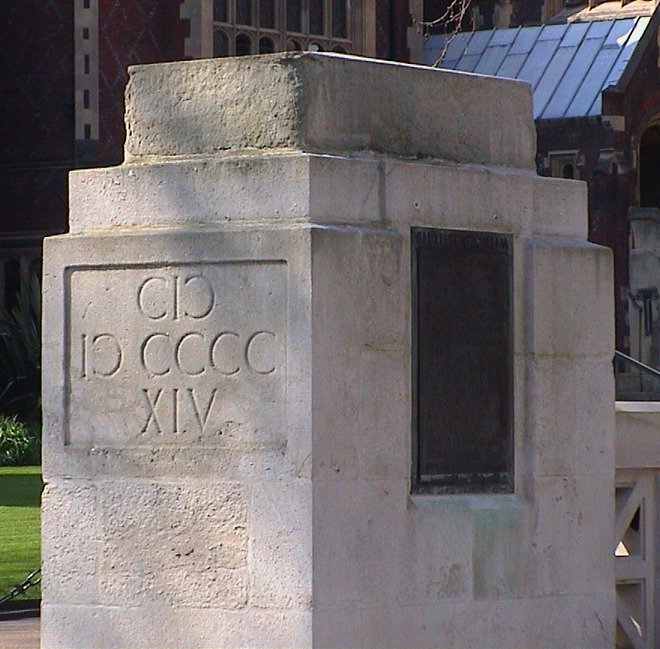 In memory of our comrades of the Inns of Court Regt. who gave their lives in the 1939 - 45 war. We have never seen so many Cecils, Cyrils and Cuthberts on a war memorial, let alone Jocelyns, Joyces and Evelyns - and we don't think these are women. The names speak volumes about the sort of men these were. The Roman numerals on the end piers are very interesting (to us nerds). We would expect these dates to start with M, representing 1000 but the front part seems to read "( I ) I )" where the brackets are shaped as forwards and backwards Cs. Now, D can be represented as a I followed by a backwards C and, as everyone knows, D represents 500, and that is how to read the second "I )". But, fascinatingly, (nerrr) the first three characters " ( I )" have to be read quite differently - as a I in brackets - which comes from the Etruscan system and represents 1000. And it is thought that the Roman M comes from this symbol (they sort of look similar) . Aren't you glad you stuck with us? David Hopkins has provided the Latin translation for us. He points out that the inscription is quite cleverly constructed because the upper and lower lines can be read independently. 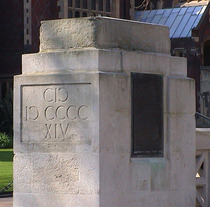 The upper line in the centre of the memorial conveys the headline SANGUINEM PRO PATRIA LARGITIS, meaning “For those who generously gave their blood for their country” and the lower line along the seating area reads HOSPITIUM SOCIIS FILIIS PARENTES, meaning “Offer your solidarity in honour of the allied sons”. David also visited the site, where he was entertained by the gatekeeper, Richard Vere-Compton, who gave him a leaflet about Lincoln’s Inn and a rendition of a couple of his war poems.